Katja Valli and Robert J. Hoss. 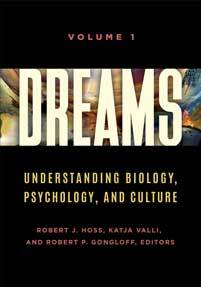 Dreams: Understanding Biology, Psychology, and Culture [2 volumes]. Greenwood, 2019. ABC-CLIO, publisher.abc-clio.com/9781440856174. This two-volume set examines dreams and dreaming from a variety of angles—biological, psychological, and sociocultural—in order to provide readers with a holistic introduction to this fascinating subject.